Instead of seeking to destroy diversity, dharma traditions have presented a vision of varṇa vyavastha wherein diversity was not only recognized as a fundamental reality of the human society, but was made the foundation stone of human welfare. “Dharmo viśvasya jagataḥ pratiṣṭhā” declares one of the Śruti texts. This declaration has served as a foundational principle for dharma traditions and generation after generation of dharmaśāstra authors to attempt to conceive of a social order, which truly upholds and uplifts all individuals. Dharma means “that which upholds” and hence, a social order based on the dharma should be such that it leads each individual to well-being and fulfillment, all the while establishing justice and harmony in the society, a notion well summarized in the popular saying “lokāḥ samastāḥ sukhino bhavantu”, which means “let all beings in the world attain happiness”. Unlike the modern society, which derives much of its worldview from the West, the dharma traditions did not conceive of a society in terms of idealistic, albeit impractical concepts like equality and egalitarianism, which when taken to its logical conclusion promote sameness and destroy diversity. Instead, the ṛṣi-s and the authors of dharmaśāstra conceived of a social order wherein the uniqueness in temperaments and capabilities of every individual was not only recognized, but was made the central piece of the entire conceptual social structure and called this conceptual framework “varṇa vyavastha”. Though, varṇa system has often been understood as a reference to “caste system” or “class system” representing a social grouping, in this paper, the primary usage of the term in the veda and dharmaśāstra as a “conceptual framework” has been retained. The paper will first briefly explore the meaning of the term varṇa in the context of their descriptions available in some of the prominent Hindu texts and then will construct a conceptual framework of varṇa based on key principles described in these texts. The sūkta mentions how brahmaṇa, kṣatriya, vaiśya and śūdra manifested out of Cosmic Puruṣa’s head, hands, thighs and feet, respectively. The different limbs of a body, though being inseparable part of the body, are distinct from each other in their nature and function. For example, the quality of the head is intelligence and accordingly its function is thinking and decision making. Distinct from this are the feet, which have the quality of movement and hence a function of carrying the body to different places. The same is the case with other organs. Another key principle that can be derived from this account is that the conceptual arrangement of varṇa-s are neither pyramidal, nor hierarchical, as often understood. Just as different limbs of a body perform different function and are vital for the health of the entire organism, different varṇa-s represent different functions in the society as well as in the cosmos with each being vital to the functioning of the whole. If there is a hierarchy, it is only in terms of understanding the goals of life at the level of individuals and not at social level. In any case, the twin features of svabhāva and svadharma appear again and again across Hindu texts of different genres. Manusmṛti (1.87), for example, describes how cosmic Puruṣa allotted different duties to people born from His different limbs for the sake of protecting and sustaining the universe. Similarly, Bhagavad-gītā also speaks about creation of four varṇa-s based on guṇa (natural qualities and tendencies) and karma (personal duties) (verse 4.13) and that the duties have been allotted based on the guṇa-s that arise from svabhāva (verse 18.41). Bhāgavatapurāṇa (11.17.13) stresses that the four varṇa-s that originated from the supreme Puruṣa are to be recognized/designated by their ātmācāra (natural activities or personal duties according to inherent nature). Mahābhāratam (12.188), on the other hand, assigns a color to each varṇa that symbolically represents the attributes/svabhāva associated with that varṇa, reflecting the three qualities of the nature (prakriti): sattva, rajas, and tamas. It is interesting to note the very terminology of varṇa embeds within itself these two key features. The term varṇa is derived from the verbal root ‘vr’, which has a number of meanings, prominent among them being: color and choosing. While the color highlights the aspect of svabhāva, the choosing highlights the aspect of svadharma. The relationship between svabhāva and svadharma are those of cause and effect. But, in this case, in addition to its role as an effect, svadharma also reinforces the cause and ultimately helps an individual to transcend it. That is, while svabhāva determines the svadharma of an individual, the performance of svadharma will transform the svabhāva from its current condition to a higher condition. As Sureshwaracharya (n.d) notes “From the performance of obligatory actions, righteousness arises. From the arising of righteousness, sins are destroyed and purity of mind ensues.” Using this interplay between svabhāva and svadharma, we can identify key elements of varṇa vyavastha and develop a conceptual framework based on it. a. Identification: The very first element required to construct a conceptual social order based on varṇa is a proper “mechanism” using which varṇa of an individual can be identified. And such a mechanism has been provided to us in Bhagavad-gītā, which says that the duties of various varṇa-s are to be classified based on the guṇa-s born from svabhāva (verse 18.41). A similar view has been expressed by Lord Shiva in Mahābhāratam (Anuśāsanaparva, Ch. 143). Thus, “svabhāva” of an individual is the key for identifying the varṇa of that person. But, this svabhāva of an individual is in-turn determined by two factors: the natural tendencies inherited from one’s parents and the mental impressions (saṃskāra-s) one inherits from previous lives; and both these factors are in-turn dependent on prārabdha karma-s that decide where and in which family a person takes birth into, the life challenges that he or she will be facing in life, etc. It is for this reason, ‘birth’ or ‘janma’ was used as an identifying factor for determining varṇa. But, here the reference is to the ‘prārabdha karma’ and the svabhāva one inherits due to prārabdha and not necessarily a reference to being born in a tribe, caste, class, or family. b. Classification: With guṇa and svabhāva as the identifying factor, Hindu dharma texts have created four conceptual categories: brahmaṇa, kṣatriya, vaiśya and śūdra. Adi Shankaracharya, while commenting on Bhagavad-gītā (4.13 & 18.41) says that brahmaṇa is a designation given to one in whom there is a predominance of sattva; kṣatriya is one in whom there is both sattva and rajas, but rajas predominates; in vaiśya, both rajas and tamas exist, but rajas predominates; and śūdra is one in whom both rajas and tamas exist, but tamas predominates. These guṇa-s are revealed by the natural temperaments and behavior exhibited by the person. Elaborating on this, Bhāgavatapurāṇa (11.17.16-19), lists what temperaments and behavior indicates what varṇa designation to be assigned to a person. It says: the control of mind and senses, austerity, cleanliness, satisfaction, tolerance, simple straightforwardness, devotion to God, mercy, and truthfulness are the natural qualities of the brahmaṇa-s; dynamic power, bodily strength, determination, heroism, forbearance, generosity, great endeavor, steadiness, devotion to the brahmaṇa-s and leadership are the natural qualities of the kṣatriya-s; faith in God and Vedas, dedication to charity, freedom from hypocrisy, service to the brahmaṇa-s and perpetually desiring to accumulate more money are the natural qualities of the vaiśya-s, service without duplicity to others, cows and gods and complete satisfaction with whatever income is obtained in such service, are the natural qualities of śūdra-s. Therefore, dharmic texts clearly give a wide framework by which people can be designated and classified according to their inherent temperaments. But, this four-fold classification is essentially a conceptual classification based on four ideal svabhāva conditions (i.e. having a clear cut svabhāva) and may not always reflect a ground situation, especially in kaliyuga in general and at current times in particular, as society is stratified along caste, profession, and political lines and the concept of guṇa and svadharma no longer drives the society. Nonetheless, this four-fold guṇa based varṇa and the assignment of ideal duties that a person with a particular svabhāva must practice, will act as general guidelines, which would not only help societies to evolve their own practical models according to their own unique social conditions, it will also help each individual to examine one’s own temperaments and inner leanings and compare and evaluate with respect to four-fold conceptual model and understand where he/she stands in life, such that people may choose their svadharma accordingly to attain material and spiritual success. c. Assignment: After successful identification and classification of the varṇa-s of people, the final stage is the assignment of duties or svadharma for each person according to his/her own inherent temperaments. Bhagavad-gītā (18.42-44) assigns following duties to people exhibiting different varṇa svabhāva. Brahmaṇa-s are assigned: control of the internal and external organs, austerity, purity, forgiveness, straightforwardness, jñāna (Knowledge of the scriptures), vijñāna (experiential understanding of what is presented in the scriptures) and āstikya (faith and conviction in the truth expounded in the scriptures regarding God, etc. ), as their duties. Similarly kṣatriya-s are assigned: heroism, boldness, fortitude, capability, and also not retreating from battle, generosity and lordliness; vaiśya-s are assigned: agriculture, cattle-rearing and trade; and śūdra-s are assigned service as their duty. Manusmṛti (1.88-91) has further elaborated the duties for people having the four varṇa guṇa-s thus- teaching and studying, sacrificing for their own benefit and for others, giving and accepting (of alms) as duties of brahmaṇa-s; protection of the people, giving charity, to offer sacrifices (yajña), to study (the veda), and to abstain from attaching himself to sensual pleasures as duties of kṣatriya-s, to tend cattle, giving charity, to offer sacrifices, to study (the veda), to trade, to lend money, and to cultivate land, are the duties of vaiśya; and serving the other varṇa-s, i.e. rest of the society by means of various professions like arts, sculpture making, wood carving, etc. It is clear from the above discussion that the duties assigned to people are a) in sync with their inherent temperaments, b) duties further seek to reinforce and strengthen the already present inner talents and temperaments, c) through performance of these duties, though different for different persons, all will attain complete success and overall welfare. It is also clear that, contrary to popular understanding, varṇa does not refer to any particular vocation. Instead it provides guidelines of a general nature regarding suitable duties for people with different temperaments, which they can in-turn implement through choosing any of the vocations, which are in sync with their svadharma. In other words, varṇa grouping is clearly a conceptual classification and has no direct connection to kula-s or clan groupings based on trade and skills. Similarly, varṇa grouping is not related to ethno-cultural jāti groupings or the colonial formulation of castes. However, it must be conceded that whenever a practical social model is derived from this conceptual framework of Varṇa, it is bound to result in overlapping with different social groupings and identities: be it social-economic groups, ethno-cultural groups (jāti), or groups based on clans and/or professions (kula). But, the mere presence of such overlapping does not mean that varṇa based social model will become identical to social stratification along the lines of castes, jāti, or kula. Instead, Bhāgavatapurāṇa (7.11.35) explicitly states that a person’s guṇa must be the driving factor behind assignment of a particular varṇa to him, irrespective of the social class, he is born into. That is, meritocracy will the central driving force of such a Varṇa-based social order. Thus, it is important to distinguish the conceptual framework of varṇa enunciated in the paper from different social groupings like kula, jāti, and caste present in the society. And it is also vital to recognize that any practical social model constructed with varṇa as a basis will have to evolve means to address these social stratifications. Hindu dharma conceives a four-fold goals of human life called “puruṣārtha-s”: dharma, artha, kāma and mokṣa. This framework of life wherein each human being has an obligation to pursue the four-fold goals in his or her life is a unique and very important contribution of Hindu philosophy. Since, human life is considered very unique due to them having free-will and the ability to make choices, the dharma traditions have conceived four puruṣārtha-s to provide a guidance for the exertion of this free-will in a righteous and meritorious way. While artha and Kama refer to pursuing worldly pleasures and prosperity, respectively, mokṣa refers to pursuing spiritual emancipation in the form of ultimate liberation from the cycle of birth and death. Dharma, on the other hand, is the connecting principle, which on the one hand facilitates an individual to attain artha and kāma, all the while taking one closer and closer to mokṣa as well. Thus, dharma in the form of righteous duties facilitates each individual to attain all the four puruṣārtha-s. The importance of puruṣārtha-s as life goals in an individual’s life can be understood by correlating it with the Maslow’s hierarchy of needs, a motivational theory in psychology proposed by Abraham Maslow in 1943. The hierarchy is often understood as a pyramid categorizing various human needs that motivates people to work towards fulfilling them. The five-tier model, slots the most fundamental needs of people like food, clothing, etc. at the bottom. On the top of this, comes the needs for safety, followed by social belongingness, esteem, and finally self-actualization at the top. 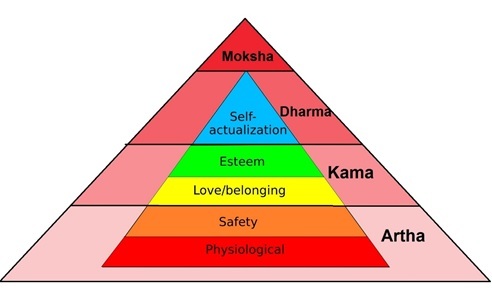 Superimposing Maslow’s hierarchy on Hindu puruṣārtha-s, we can see how the most basic physiological and safety needs at the bottom of Maslow’s hierarchy corresponds to artha, while the human need for love, belongingness and esteem corresponds to kāma. Self-actualization, which Maslow defines as “What a man can be, he must be”, refers to each individual’s inner potential and the individual’s need for realization of this potential in life. This is nothing but the inner-calling that manifests as svadharma and thus corresponds to dharma of Hindu puruṣārtha-s. It is interesting to note that the traditional ordering of artha before kāma, i.e. safety and physiological needs before emotional needs finds coherence in Maslow’s hierarchy as well. While Maslow places self-actualization at the top, puruṣārtha-s place dharma at the very beginning, thus aligning even other needs at the bottom to the higher need of self-fulfillment. While mokṣa did not find any place in the original Maslow’s hierarchy, in his later years, he created a new category called self-transcendence, higher than self-actualization, which he posited as a higher goal rooted in spiritualism. However, Maslow’s hierarchy has some notable limitations, including its inability to explain how different needs manifest differently in different individuals, probable causes for such differences, the role of inner temperaments, etc. Nevertheless, from the correlation between the Maslow’s hierarchy and Hindu puruṣārtha-s, we can realize how puruṣārtha-s are very vital for people to lead their lives to the fullest. An individual will only find self-fulfillment and contentment, when he is able to understand his inner potential and work towards realizing them on the ground, all the while also fulfilling his other basic needs, on the one hand and slowly moving towards spiritual emancipation, on the other. Thus, performance of svadharma or righteous duties constitute the key to attaining overall wellbeing by an individual. Dharma traditions enunciate these righteous duties as having two aspects. The first is the sāmānya dharma, which deals with the ethical principles like truth, non-injury, non-stealing, etc., which are common duties of all beings. The second is called the viśeṣa dharma or special duties, which are unique to every individual depending on the kala (time), desha (place), varṇa and āśrama. Among these different elements of viśeṣa dharma, it is the varṇa–dharma along with āśrama –dharma that caters to different stages in a person’s life, which can be considered as the most defining principles of svadharma or righteous duties with respect to an individual, since they alone cater to the unique temperaments, potential competencies, and inner calling of an individual. Notably, the varṇa model places knowledge, particularly spiritual knowledge (adhyātmavidyā) and transcendent knowledge (ātmavidyā) at the top, like the head of a human being and a whole conceptual framework has been conceived such that all other mundane activities be it politics, commerce, or labor, are perceived as actions that facilitate individuals to eventually reach the ultimate goal of jñāna & mokṣa. In fact, a clear correlation between varṇa–āśrama, on the one hand, and puruṣārtha-s on the other hand can be established. Though, the four puruṣārtha-s are equally applicable to all human beings irrespective of their varṇa, there is also a clear correlation between the svabhāva of a person and the puruṣārtha he is most likely to consider as central to his life. In any case, what is important to note is that it is only in a social order derived from and rooted in the conceptual framework of varṇa that individuals would be able to freely pursue their inner-calling and attain complete well-being. Contrary to this, societies with equality and egalitarianism as the core principles, will invariably end up pressuring some sections to gain competencies in skills towards which they may not have any liking to, while some other sections with calling and competencies for the same skills would be pressurized to renounce them, ending up in power plays, envy and frustrations that we call today as “rat’s race”. Hindu dharma traditions have always recognized diversity as being ingrained in the very structure of the universe, destroying which is neither fully attainable nor desirable. Thus, instead of seeking to destroy diversity, dharma traditions have presented a vision of varṇa vyavastha wherein diversity was not only recognized as a fundamental reality of the human society, but was made the foundation stone of human welfare. This conceptual framework of varṇa provides the much needed alternative vision to current discourses rooted in notions of sameness, which sidelines diversity and induces a rat race in the society by forcing individuals to abandon their inner calling. The varṇa framework recognizes each individual as a unique person with unique temperaments, capabilities and inner-callings, fulfilling which alone will bring happiness, contentment and spiritual emancipation to that individual. This making of self-actualization, the interplay between svabhāva and svadharma as the linchpin of the dharmic vision for a harmonious social order that upholds merit and preserves diversity is perhaps the most important contribution of Hindu dharma traditions to the world. “May peace radiate there in the whole sky as well as in the vast ethereal space everywhere. At the individual level, Hindu traditions prescribe four puruṣārtha-s as the goals of life, mokṣa or liberation from life and death being highest of them. Though the four puruṣārtha-s are common to all, each varṇa is associated with one puruṣārtha-s as most suitable for them. For example, brahmaṇa with mokṣa, kṣatriya with dharma, etc. The gist is, each individual must travel through the whole process to finally attain mokṣa, either in one life or through many lives. Thus, a person with kṣatriya temperament and function, may look up to brahmaṇatva or quality of brahmaṇa as being higher goal to which he must strive for by first perfecting his duty as a kṣatriya. The “spontaneous choosing” is a reference to our inclinations to certain activities, certain professions, which come naturally to us. While “choosing” is usually understood as a choice made using exertion of free-will, our free-will is always not free enough to follow the inner-calling. Our willfully made choices are often constrained by our life situations, family, society, etc., which may force us many a times to abandon our inner-calling. The paths chosen, thus, may not be in sync with our svabhāva and hence, may not reflect our svadharma. Thus, the śāstra-s, the tradition, and the guidance of Gurus, are often required to, in any case, are helpful, for person to understand his inner callings and the svadharma, which is most suitable to him/her. Sri Sureshwaracharya. Naishkarmyasiddhi. Prose portion of verse 52. Hindu tradition divides actions into three categories: sañcita, prārabdha and āgāmi. Sañcita is the storehouse of all karma-s. Prārabdha refers to that portion of sañcita which has become ready to give results. Agāmi refers to actions performed in the present, which will give result in future. Thus, prārabdha karma–s refer to those actions performed in previous lives, which has become ready to give fruit and which decides among other things, where one takes birth, into which family, which conditions, and with what inherent tendencies. Mahābhāratam notes that people attain different varṇa-s due to “nature”, i.e. inherent svabhāva. After explaining how conduct (svadharma) and quality determines varṇa, it further notes that the distribution of varṇa-s using birth is only for the sake of classification, i.e. birth was used only as easy reference to inner svabhāva and hence, it is svabhāva and not birth into a family, which is the real criteria for determining varṇa. See Mahābhāratam Anuśāsanaparva, Ch. 143. Though, some like Sri Jnanananda Bharathi (2013) believe that birth in a particular family, caste, or community is an index of previous store of actions, which by themselves cannot be seen. Hence, birth in a particular family in itself determines varṇa. [Cited from Bharathi, J (2013). Stray Thoughts on Dharma. Chennai: Sri Gnanananda Bharathi Grantha Prakasana Samithi]. However, Mahābhāratam (Anuśāsanaparva, Ch. 143) itself notes: “Even a śūdra, O goddess, that has purified his soul by pure deeds and that has subjugated all his senses, deserves to be waited upon and served with reverence as a brahmaṇa. This has been said by the Self-born brahmaṇa himself. Neither birth, nor the purificatory rites, nor learning, nor offspring, can be regarded as grounds for conferring upon one the regenerate status. Sūdra, if he is established on good conduct, is regarded as possessed of the status of a brahmaṇa. The status of Brahma, O auspicious lady, is equal wherever it exists.” Similarly, Bhāgavatapurāṇa (7.11.35) explicitly states that a person’s svabhāva must be the driving factor behind assignment of a particular varṇa to him, irrespective of the social class, he is born into. Thus, birth into a family or community can at best serve as a provisional indicator of one’s varṇa, and not as an absolute criteria. This is especially true for kaliyuga, wherein, unlike previous yuga-s, there is very less sync between birth in a family, svabhāva, and our livelihood activities. Nevertheless, birth cannot be altogether done away with, since, the svabhāva-s inherited from the parents still play an important role in determining svabhāva of the children and hence may be provisionally used as one of the determining factors. A brahmaṇa varṇa person, for example, may be a teacher teaching wide range of subjects, or a priest at a temple, or a Ritvik, etc. who performs yajña, or a scholar in any of the vidya-s. Similarly, a śūdra may well have been a painter, wood carver, architect, sculpture, labor, artisans, or in any other profession in the service industry. It is important to distinguish between jāti as it appears in dharmaśāstra texts like Manu and the jāti as an ethno-cultural group or jāti –kula groups derived from trade guilds. While the ethno-cultural group was a social group with endogamy etc., the usage of the term jāti in texts like Manusmṛti is not in reference to such groups. On the other hand, from chapter 10 of Manusmṛti we can see that jāti has been used as a term to refer to people with svabhāva of mixed varṇa. While four clearly distinguished svabhāva-s are called four varṇa, mixed svabhāva-s are called varṇa – saṅkara or jātis. Kāma refers to all kinds of worldly desires. Every person has one or the other desires or fantasies that he or she wants to attain. The desire may to look beautiful, or earn money or having a relationship with a person. Every kind of desire can be categorized under kāma. Similarly, all wealth, all objects that are acquired in order to fulfill the desires and enjoy a comfortable life is termed as “artha”. Thanaseelen Rajasakran et.al (2014) note: “The researchers propose that the Hinduism’s four purusharthas, or aims of human existence (Sharma 2006) provides an alternative framework to Maslow’s need hierarchy. Purushartha combines two concepts, purusa means person and artha means aim or goal… Kama or physical desire includes physiological and safety needs; Artha is a desire for prosperity and includes the need for love or belongingness; Dharma is associated with one’s esteem, which can be achieved through a sense of accomplishment and an important urge that needs to be cultivated during one’s life; and, Moksha is liberation from all earthly desires, possibly after they are satisfied, and efforts to realize the truth begin after achieving this liberation from earthly desires (Sharma 2006).” [Rajasakran, T, Santhidran, S & Raja, S S. (2014). Purushartha: Maslow’s Need Hierarchy Revisited. Anthropologist. 18. 199-203.] Though the authors equate esteem with dharma, it is more proper to equate esteem with kāma and self-actualization with dharma, because dharma is not as much about esteem as it is about inner-calling, self-fulfillment and purpose in life. Śūdra-s i.e. those with śūdra svabhāva are simple minded who have a mundane and worldly outlook. Thus, their primary concern is often limited to their everyday life, family, children, and happiness. In other words, their primary goal is ‘kāma or fulfillment of worldly desires of themselves and their families. It is for this reason, śūdra varṇa is also considered to have only one āśrama (stage in life) of gr̥hastha (householder), wherein they can satisfy their worldly desires including sexual ones. Similarly, vaiśya varṇa is associated with the puruṣārtha of ‘ārtha’ (gathering of wealth), because their svabhāva drives them to pursue wealth and prosperity; kṣatriya is associated with dharma, because their foremost duty is the protection of dharma and the welfare of citizens, and not pursuance of personal desires or wealth; and brahmaṇa-s are associated with mokṣa, because it is the ultimate calling of the brahmaṇa and they are by svabhāva spiritual in outlook. In fact, Vajrasucika Upaniṣad (Verse 10) says, a true brahmaṇa is one who has established himself in Brahman i.e. Attained mokṣa. For correlation between varṇa and āśrama, See Vaikhānasa Dharmasūtra 1.1, which notes that brahmaṇa has eligibility to all the four āśrama-s, kṣatriya to three and vaiśya-s to two. By implication, śūdra-s are entitled only to vivāha or gr̥hastha because all are allowed to marry. 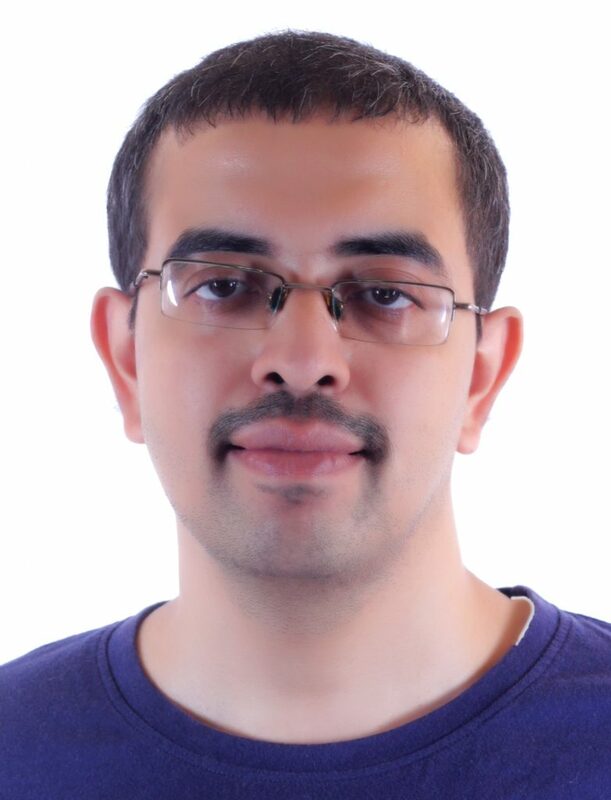 Rao, S (2010). Sadharana Dharma- the Indian doctrine of Universal Human Duties. In Srivastava, D C & Bruah, B H (Editors, 2010). Dharma and Ethics: The Indian Ideal of Human Perfection. New Delhi: D K Printworld. Gita Supersite. (n.d.). Retrieved Otober 23, 2017, from https://www.gitasupersite.iitk.ac.in/.